As I later learned, I’m not the only one who’s tired of having such a useless key in such a prominent location. This entry was posted in me, techie. Bookmark the permalink. Interesting. I USE THE CAPS LOCK PRETTY OFTEN. oOPS! This post was actually an experiment to see if I could write something that was tech-oriented with a sufficiently catchy headline to get ranked highly on Digg ( http://www.digg.com/mods/A_5_second_hack_that_will_eliminate_typos ). I was curious how hard it is to get something on Digg these days. Based on the two Diggs I got (one being me) it seems fairly challenging. I do hate the caps lock key, but I hardly ever hit it. The point where it got really annoying is when I was doing a lot of alt-tabbing between windows, and then shift-left and shift-righting between tabs in a window. I found myself hitting the caps lock key a lot during that process, although I don’t hit it when typing normally. 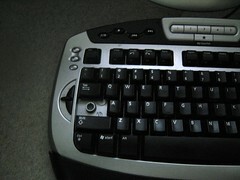 Hey Tom, one geek tip I use is remapping caps lock to control. This way I can press ctrl+c without scrunching up my fingers on my tiny laptop keyboard. I use AutoHotKey (Windows Utility), but there are others I’m sure.